The 4th Annual Guatemala Billfish Invitational will take place May 2-6 at the legendary Pacific Fins Resort & Marina. 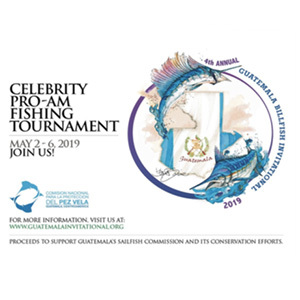 Well-known anglers from across the globe will compete in this exciting three-day event while raising money to support Guatemala’s Sailfish Commission and its conservation efforts. This tournament provides a unique opportunity to fish the most prolific billfish destination on the planet in prime time, while you network with fellow anglers, celebrity guests, and potentially earn bragging rights for the next 12 months! The tournament will kick off on May 2nd at the lodge with the professional chefs creating a full-on feast for the check-in and opening party. Fishing dates are May 3, 4 and 5, with an award’s ceremony taking place the night of the 5th. Guests will depart on May 6. The tournament costs $3,500 per person and includes four night lodging, double occupancy, daily laundry service, a la carte meals, beverages, transportation to and form the airport and three days of fishing. When fishing with Pacific Fins you can expect all of the tackle and gear to be top-notch and the crews to speak English. During the tournament there will be four anglers per boat. Each day of fishing also includes snacks, fruit, lunch and beverages. The experienced captain and crew will always do everything in their power to keep you on the fish. Pacific Fins Resort & Marina is Guatemala fishing at its best. The boutique hotel offers private villas and suites and is located in the world's most productive billfishing destination. The world-class chefs offer Á la Carte dining, open bar and personalized concierge service. The setting on the water and attention to detail is unmatched. For more information contact Ozzy Delgado at 888-431-5556 or ozzy@pacificfinsresort.com. You can also visit PacificFinsResort.com.